The Bayou Classic Cast Iron Roaster is the best seller out of Bayou Classic’s cast iron cookware collection. The Bayou Classic Cast Iron Roaster is the perfect roaster for slow roasting turkeys, chicken, ham and pot roast. When you compare the Bayou Classic Cast Iron Roaster with other aluminum or stainless steel roasters, you will see that the Bayou Classic Cast Iron Roaster distributes heat evenly. This process makes your meat more tender and juicy and well as cooked evenly. The Bayou Classic Cast Iron Roaster is not just for slow cooking meats, you can also slow cook stews, gumbo and chili. 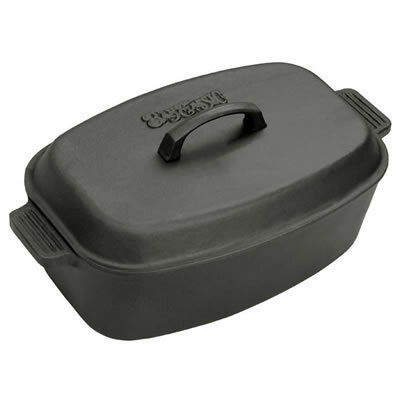 The Bayou Classic Cast Iron Roaster has an oval design and measures 18” L x 8” W x 6” H (without lid). The Bayou Classic Cast Iron Roaster does include the pictured cast iron domed lid. • Cast iron domed lid.